Expanding the horizons of Final Fantasy! A tale of many encounters and the birth of a new world. 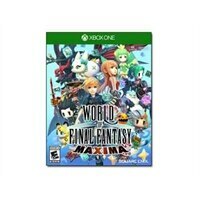 World of Final Fantasy features the avatar change system, which allows the protagonists, Reynn and Lann, to fight as champions. Fight your way through exhilarating battles as legendary Final Fantasy heroes.